This isn’t a game Charlie. What’s their story? How did they get here? To here, this moment in time. 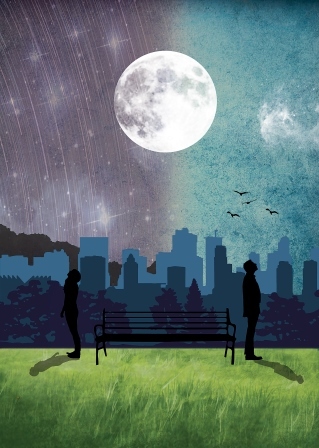 Told in reverse order, this new play starts at the end and takes us back to the beginning when Charlie and Emma first met, falling in love quicker than the skyline falls to dust and tumbling hopelessly into a cycle of thoughts that aren’t said and actions without meaning. Organised Chaos is all about showcasing some of the amazing new and emerging talent in the Northwest – this show does exactly that with some great characters to be portrayed. 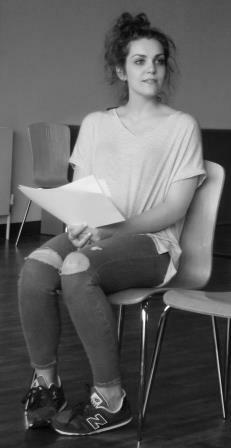 The cast includes Taran Knight “Charlie” and Francesca Heraghty-Smith “Emma”. Behind the scenes we have the writer Clem Haran, the director Mark Croasdale, stage manager Diane Wright and designer Rebecca Luck with Phil Minns supporting with dramaturgy of the script. Following a number of top reviews and sell out shows this production will be Organised Chaos’ fourteenth since we started in 2009 – during this time we have showcased a lot of new talent to Northwest audiences – actors, writers, directors, designers to name a few of the roles involved in making a show a reality. In 2012 our production of AfterWords won Best New Writing at The Buxton Fringe Festival. This show is our fourth to be supported by the Arts Council through National Lottery funding. To be recognised by the Arts Council for our achievements in supporting some of the great new and emerging talent is great news for us. It’s fantastic that we’re able to better financially support the debut of this fantastic new play and the talent involved. Lightspeed is told in reverse order – A play that starts at the end and finishes at the beginning sounds like a good idea and certainly to watch as an audience we believe it’s very engaging. By using this different approach to time and structure we believe this will be quite a unique experience for our audiences. This entry was posted in Lightspeed, Productions and tagged Lightspeed, manchester theatre, new writing, organised chaos productions, theatre on June 6, 2015 by organisedchaosproductions. 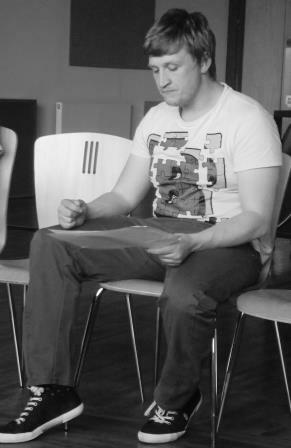 Let’s get the usual stuff out the way – I’m Mark, budding creative artist and theatre practitioner. I’ve previously worked with Contact Theatre Manchester, New Theatre Sydney and organisations including Hercules Productions, Coalition of Mischief and Amnesty International. I came to Organised Chaos after directing four shorts plays for their annual Mid-Winter Ignition and now make my debut with them directing my first full-length production, Lightspeed. Wouldn’t it be nice if I could start this post with the words ‘Some years later”. Instead of writing about my nerves for opening night I could then write about the success the show achieved and all the audience feedback. I could post pictures from the tour and tell you all the funny stories knowing that I don’t need to worry because ‘some years later’ it will all have happened already. Only that’s not possible, because in real life I can’t move freely through time, i’m stuck in the present. That’s the beauty of theatre. In theatre ‘some years later’ can come in two minutes or in the case of Lightspeed, ‘some years later’ can happen in the very first scene. A play that starts at the end and finishes at the beginning sounds like a good idea and certainly to watch as an audience it’s very engaging. However, to act or direct a ‘backwards’ play does present some odd problems – “what scene is next?”, “has Emma found what she’s looking for yet?”, “is this scene before or after the major event?”. Actually the answer is both really, In ‘play order’ it hasn’t happened yet but in chronological order it has – or sometimes vice versa. Then, as with all good plays, there are so many emotions to be dealing with too! In a typical play the actors can build on their character journeys and rise to a climax but going backwards on stage is harder, the characters climax has already happened – but then the play structure itself still needs a climax later on otherwise it falls flat! Basically it can be easy to get lost, but that’s both a problem and a blessing. Luckily i’m working with two wonderful actors, Taran Knight and Francesca Smith, both of whom seem not to mind being lost with me. In rehearsals each of them have found themselves on stage being incredibly honest with themselves and me – getting giddy, going red from embarrassment, feeling awkward and anxious and sometimes shouting with frustration – and that’s all before we began looking at the script! This is because, as with any process, it all boils down to playing with what you have and because of it’s topsy turvy nature the script lends itself very well to it. I’m a firm believer in play, but also in shaking an actor out of their comfort zone because it’s when we feel uncomfortable we make more believable decisions and the magic happens. Sometimes this has proven difficult or seemingly unnecessary but it’s actually very important to get lost, to allow yourselves to lose all ideas of what it should be because then you can end up surprising yourself and either getting to where you wanted with more knowledge or, lots of the time, getting somewhere better! We’ve managed to create a magical, sometimes surreal, time-lapse of a relationship that i’m thoroughly enjoying. With that in mind, combined with all the good things that come with an Organised Chaos production, this process has proven wonderfully anarchic. There’s been a bit of play and discovery and it seems that, just like watching the play, the process of creating it has always kept me guessing. Saying that, we’re on in a week so I’d better get back to making those decisions! This entry was posted in Directors, Introducing, Lightspeed, Productions and tagged Lightspeed, manchester theatre, mark croasdale, new writing, organised chaos productions, theatre on June 6, 2015 by organisedchaosproductions. This entry was posted in Lightspeed, Productions and tagged Lightspeed, manchester theatre, new writing, organised chaos productions, theatre on May 31, 2015 by organisedchaosproductions. My name is Clem Haran and I am a 22 year old graduate of Middlesex university who is based in London. I studied Theatre Arts (Solo performance) graduating with a 2:1 and prior to that I studied a Btec in performing arts (acting) at Kingston College. In my final year of uni I focused on three major projects; An Interactive installation, a Stand up comedy (musical comedy based) routine and a submission of a play. I loved the course I love technical and anything behind the scenes especially prop making. My final year allowed me to focus in the three areas I was extremely interested in script writing being one of them. Ever since my time at college I’ve been influenced by playwrights such as Martin Crimp and Simon Stephens. These both have inspired ideas and works I have created and the style I like to use. I’ve only been out of university a year and 5 months and in that time I’ve written original music for a musical about cheese that I, along with a friend took to a local festival and together put on. I was involved in a performance art based show with a friend and also I was asked to play piano for another friend as part of a charity gig. And I currently I run a theatre workshop for ages 13/14. What I want to get from this experience ? I’ve always been rooted into the medium and practice of theatre which is why I chose to study the practical course in theatre arts and not creative writing. I would call myself a playwright but I’m also other things. I love theatre and I love being able to get involved with many different projects using a variety of skill-sets. 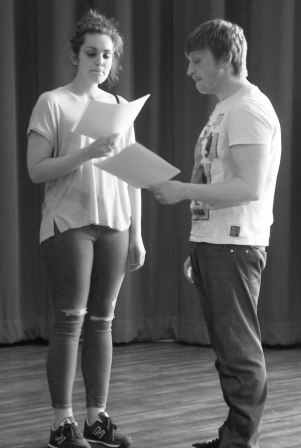 I want to work with a theatre company for the opportunity for my work to develop. It will be nice to work with new people as opposed to friends, I think it will give me a fresh non-biased opinion. I am essentially fresh out of university and so I’m still eager to learn, to impress and to get my work out there. I’m not a one trick pony. I like to think so anyway. This entry was posted in Introducing, Lightspeed and tagged Clem Haran, Lightspeed, New Writing. theatre, organised chaos productions on April 16, 2015 by organisedchaosproductions.